It is hard to be overshadowed during a season when you have an 8-2 record, 2.35 ERA, 1.01 WHIP, 11.0 K/9 and 3.0 K/BB in 73 innings. And that doesn’t even mention the MLB best hit (5.3 H/9) and home run (0.1 HR/9… just 1 HR allowed) rates. Alas such is life when you are teammates with Stephen Strasburg (he of the 7-1 record, 2.41 ERA, 1.04 WHIP and MLB-best 11.7 K/9 heading into his Wednesday afternoon start) as is the case for Washington’s Gio Gonzalez. Gonzalez is in the midst of a Cy Young-worthy season with only his teammate standing in his way at this point. I’m sorry, but Zack Greinke having a better fWAR than both of them shows a flaw in fWAR as far I am concerned. Results have to count for something. Greinke has been fantastic again in 2012 despite being saddled with a .350 BABIP that has no doubt contributed to his 1.22 WHIP, but part of that is on him. Getting obliterated by the Cubs (8 ER in 3.7 IP) and the D’Backs (7 ER in 2.3 IP) no doubt elevated that BABIP so you can’t just blame the defense, claim bad luck and move on expecting things to regress to a more palatable level. Strasburg’s biggest implosions are a pair of 4 ER outings, both of which still saw him last longer than either of Greinke’s. Gonzalez, meanwhile, was popped by the Cubs in his opener (4 ER in 3.7 IP) and hasn’t given up more than 3 ER since including four scoreless outings of six or more innings. Apologies for the tangent, I was just perturbed to see fWAR list Greinke at 3.0, Gio at 2.7 and Strasburg at 2.6. How Strasburg is last among those three is beyond me. Both Nats fan more than Greinke, he walks fewer than either and he is in the middle for home runs. His ERA and WHIP are significantly* higher. OK, improvement is a bit of a stretch for 2010 to 2011 as he simply walked one less batter in virtually the same amount of innings. In fact, his 92 walks in 2010 didn’t even lead his league thanks to C.J. Wilson’s 93, but 2011’s 91 led all of baseball as he was the only one to reach 90. So what has changed in Gonzalez that has elevated from a quality mid-rotation arm with potential to ace-level material (with only some of the potential showing) through the first two and a half months of the 2012 season? Obviously shifting into the National League has aided some of the improvement as it is generally an easier league for pitchers to traverse due in part to the fact that they get to face their counterparts a couple of times a game and even when they aren’t, they are facing pinch hitting bench types instead of a DH. So far in 2012, starting pitchers in the National League are 0.41 ERA, 0.05 WHIP, 0.4 K/9 and 0.2 BB/9 better than their American League counterparts. Factoring those changes into Gonzalez’s current totals is a bit crude, but just for the sake ease it would push him to 2.76 ERA, 1.06 WHIP, 10.6 K/9 and 3.9 BB/9. Among the reasons it is crude include the fact that the AL numbers are influenced by Oakland being the worst hitting team in that league and he wouldn’t face them. Of course, he would also get to pitch in Oakland’s stadium which is very friendly to pitchers (Gio had a 2.63 ERA there the last two years). Regardless of league, it is clear that Gonzalez is pitching as one of the best in baseball and his stuff would play anywhere. He has enjoyed a slight velocity gain that has given his four-seam fastball and sinker more punch. The four-seamer has improved from an average of 93.5 MPH to 94.1 MPH and he is throwing it more often going from 37% a year ago to 43% so far this year. The result has been more swings-and-misses and fewer balls in play (naturally). The sinker has gone from 92.8 MPH to 93.3 MPH. He has been more selective with it throwing it 3% less than last year, but it is generating more swings-and-misses, too. There are a few more balls in play with it percentage-wise, but a sharp rise in the groundball percentage with it suggests that batters aren’t exactly squaring it up. More strikes, fewer balls and poorer contact from two pitches that make up 68% of his arsenal is the foundation to the stark improvement in Gio’s numbers. The improvements in his four-seamer and sinker have spurred his surge in strikeouts, too, especially the four-seamer. Gonzalez has a true hammer curveball. It is his best pitch, his strikeout pitch, and one of the better ones across baseball. He has taken it to another level this year. First off, he has been more selective with it throwing it 20% of the time, down from 28% a season ago. It is easily the lowest usage rate of his career, his first time below 25% in fact, and batters are having an even tougher time doing anything with it in 2012. He is throwing it for a ball nearly 3% more at 45%, but he is generating more called strikes and whiffs with it, too. He is commanding the pitch lower in the zone which has probably led to the rise in balls thrown with it, but has also left batters powerless against it yielding a filthy .225 OPS (yes, OPS) against the pitch. There was nothing wrong with last year’s .524 OPS against the pitch, .225 is just… insane. What comes after elite? That’s what his curveball has been this year. He has had 64 plate appearances end on curveballs and just five have been hits. Nearly half, 30 to be exact, has been strikeouts while three have resulted in a walk. A big improvement for Gonzalez has been the advancement of his changeup. He used it just 8% of the time last year and while it still isn’t much more than an occasional pitch (11%), the results have dramatically improved. He achieved all of one strikeout with the changeup a year ago in his 44 plate appearances that ended on the pitch. This year has already seen 36 plate appearances end on changeups and 11 were strikeouts. Batters are swinging 10% more often and missing 6% more often despite Gio putting it in the zone 5% less often. He only threw it 2% of the time in 2-strike counts a year ago, whereas this year that number has risen to 9%. He is trusting the pitch more and it isn’t letting him down. Hitters can’t sit on the curveball expecting him to go to it in those counts like he did 44% of the time a season ago. 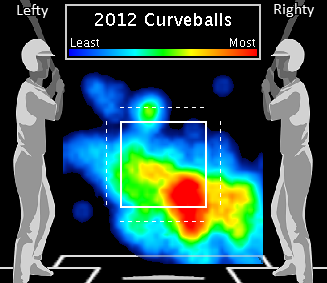 He is using the curve 32% of the time in those counts and the excess has been shifted to the four-seamer and changeup. Gonzalez is in the midst of a special season and the obvious question is whether or not he can maintain this level of success. There is nothing he has done thus far that is ridiculously unsustainable especially for a pitcher as talented as Gonzalez. The issue remains his elevated walk rate. But it doesn’t preclude him from success. When I first looked at Gio’s stat line for this year, it reminded me of Ubaldo Jimenez’s 2010 season. Even while he was running up that insane 15-1 first half record, he was still walking 3.3 per game. He ended the season with a 3.7 BB/9. In fact, he and the 2009 iteration of Clayton Kershaw are the only two pitchers in the last three years to post a sub-3.00 ERA with a 3.7 BB/9 or higher, which is what Gonzalez has done thus far. Gonzalez has a much better strikeout rate than either of those two had, but the common thread is that all three were eminently unhittable. Kershaw led baseball with a 6.3 H/9 rate while Jimenez was at 6.7 H/9 in 2010. Like I said, nothing in Gonzalez’s line is crazy and unsustainable, not even his .244 BABIP. His infield defense is sound and continue to turn the weak groundball contact he generates into plenty of outs. He has been at .274 and .287 the last two years, too, so it’s not like the .244 is a major outlier for him. He will probably allow a few more home runs and not necessarily maintain a 1 per 73 inning rate (0.1 HR/9), but even regressing that out toward his career mark (0.8) won’t sink his ERA. His xFIP is a very strong 2.91. Then just imagine if his command and control show more improvement as the season goes along and he chisels away at the walk rate. There is nothing in his line indicating that will happen, but it isn’t implausible as we watch the maturation of Gonzalez before our eyes. I would still say he is the second best pitcher on his team, but the difference has been slight thus far. They are a great righty-lefty combo atop a rotation while Jordan Zimmermann and Edwin Jackson have been great in their own right, too. If you haven’t watched a Gonzalez start this season, I implore you to do so. Not only will you have the added benefit of watching Bryce Harper play, but Gio has some of the most entertaining stuff in the game. Plus, the Nationals announcing duo of Bob Carpenter and F.P. Santangelo is really good. That statement was meant with some derision when I made it on Twitter, but I really think so. Carpenter is a strong play-by-play by with a good voice and Santangelo offers tons of great insight. The one downside I heard a few times was that they’re too “homery”, but I always compare that on a scale with Hawk Harrelson as the absolute worst & completely unlistenable, and they don’t even come close to that. I think they call a straight up game reacting properly to great stuff the opposing team does even though it goes against their Nats.